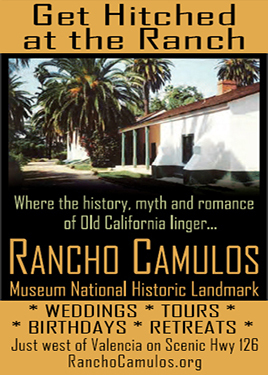 Rancho Camulos: A Comprehensive History • NRHP Nomination, 1996. Rancho Camulos: Historic Museum Overview and Vision • March 1997. Cultural Landscape Activities • January 2005. RA1001 - Chapel, Fountain, Winery, Bunkhouse, Small Adobe, Railroad. Screenshots from D.W. Griffith's 1910 "Ramona" Film. Ramona (Complete Text) by Helen Hunt Jackson, 1884. LW2963 - About Helen Hunt Jackson's Visit to Rancho Camulos; SoCal Observations • Odell 1939 (Excerpts). Ramona's Home: A Visit to the Camulos Ranch, and to Scenes Described by "H.H." by Edwards Roberts, S.F. Chronicle, 1886. LW2988 - Helen Hunt Jackson's Grave, Cheyenne Mountain, Colo. Souvenir Postcard 1912. Ygnacio del Valle Family Tree. Antonio & Ygnacio Del Valle's Roles in Privatizing Mission San Fernando, 1830s-40s from Engelhardt: San Fernando Rey, 1927. The Russian-Alaskan Church Bell: Report from Alaska Library & Museum 1923. The Russian-Alaksan Bell from Mission San Fernando at Rancho Camulos News reports, 1923. The Mysterious Russian-Alaksan Bell from Mission San Fernando at Rancho Camulos by Fr. Zephyrin Engelhardt, O.F.M., 1927. The Real Ramona & Alessandro (Alejandro), As Told by José Jesús López (1853-1939) from Latta 1976. Ygnacio del Valle, SCV Landowner & L.A. Civic Leader Pen Pictures for L.A. County, 1889. The Vaquero Mysteries: Del Valle Artwork by James Walker By Maria Christopher • Heritage Junction Dispatch, Sept.-Oct. 2017. Reginaldo F. Del Valle, Politician & SCV Landowner: Biography During Life Pen Pictures for L.A. County, 1889. The Home of Ramona from "Some By-Ways of California" by Charles Franklin Carter, 1902 (1900). Lucretia del Valle Scores in McGroarty's Mission Play News reports, 1913. Lucretia del Valle Selected as "Typical California Girl" Sunset magazine, July 1914. LW2757 - Inscribed Portrait of Lucretia del Valle at Charles Lummis House (El Alisal), n.d.
LW2759 - Lucretia del Valle Grady Christens S.S. President Cleveland, 6-24-1946. LW3119 - Ambassador & Mrs. Henry Grady (Lucretia del Valle) Depart for Washington, 4-4-1947. LW3106 - Ambassador & Mrs. Henry Grady (Lucretia del Valle) Arrive in India, 6-30-1947. LW2887 - Lucretia del Valle Grady Promotes Women's Suffrage in Iran, 1950. Lucretia del Valle Grady Obituary & Death Certificate, 1972. Ventura County to Pave Road Through Rancho Camulos (Future SR-126) • Oxnard Press-courier, 11-17-1916. Writer Links Y. Del Valle to Perea's Pico Canyon Oil Discovery • Oakland Tribune, 11-4-1918. Filing of Probate Petition, Death of Juventino Del Valle • Oxnard Press-courier, 6-11-1919. Major Patton, After 35 Years, Revisits Camulos Rancho, Historic Home of Ramona • Los Angeles Examiner, [n.d.] 1920. Ramona Myth revived at Ventura museum by Leon Worden • The Signal, 10-30-1998. Del Valle descendant pursues her roots by Marci Wormser • The Signal, 9-1-1999. Del Valle Family Played a Starring Role in Early California by Cecilia Rasmussen • L.A. Times, 11-11-2001. "Over the Range to the Golden Gate" (Excerpts: Descriptions of Newhall, Camulos, Mojave Desert, etc. ), 1896 (1884). Camulos Receives Funding to Archive Historical Papers, SCVNews.com 6-18-2013. Edwin Carewe's "Ramona": Lost SCV-Related 1928 Film Reappears After Falling to Nazis, Soviets By Leon Worden • 3-30-2014. Edwin Carewe's 1928 "Ramona" Returns from the Lost By Hugh Munro Neely • 3-29-2014. LW2958 - Edwin Carewe's "Ramona" Serialized in French Movie Fanzine, 1928. LW2080 - "Ramona's Waltz" Sheet Music for Edwin Carewe's "Ramona," 1928; Multiple Versions. LW2969 - "And I Still Do" Sheet Music for Edwin Carewe's "Ramona," 1928. LW3121 - Lobby Card: Edwin Carewe's "Ramona" (United Artists 1928). LW3332 - Edwin Carewe's "Ramona" (1928): 6 Spanish Pressbook Illustrations. LW3062 - Fan Card: Warner Baxter as Alessandro in "Ramona," 1928. LW2933 - Edwin Carewe's "Ramona" (1928) in The Picture Show Annual 1929. LW3505 - Story of Edwin Carewe's Version of "Ramona" in Italian | Cine-Romanzo, 8-4-1929. LW2787 - 1928 "Ramona" Star Dolores Del Rio in "Four Ladies of Hollywood" Sculpture, 1993 (Photo 2015). LW3352 - Loretta Young and Don Ameche in "Ramona" (20th Century Fox, 1936). LW3266 - Loretta Young and Pedro de Cordoba in "Ramona" (20th Century Fox, 1936). TV1704 - Smithsonian Using SCV Relics to Tell Nation's Story • SCVTV 2017. TV1701 - Red Sacred Heart, On Loan to Smithsonian Institution, 2017. TV1702 - Original Wooden Cross, On Loan to Smithsonian Institution, 2017. TV1703 - Tataviam Mortar and Pestle, On Loan to Smithsonian Institution, 2017. LW2793 - Del Valle Buggy, Original Condition, n.d.
LW2792 - ~1850 Del Valle Buggy, Restored 2009. Multiple Views, 11-8-2014. LW2706 - Del Valle Family Livestock Ledger, 8 Pages, June-July 1853. Del Valle Co. Labor Records, 1919-1924. RC8701 - "Ramona Cradle" from Rancho Camulos (2 Views). MU3580 - Nor. Cal. Basketry Bowl, Del Valle Family Collection, Mid-1800s. LW2453 - Portrait of Helen Hunt Jackson by Alexander F. Harmer, 1885. Annual Picnic of 1886: A Party for the Ages • News Reports, May 1886. AP1324 - Del Valle Adobe: Inner Courtyard with Fountain, late 1800s. AP0617 - Del Valle Adobe: South Veranda, late 1800s. RA5501 - Original 1886 Wooden Cross from Del Valle Chapel Garden (Photo 1955). MU0538 - Del Valle Bedroom in Main Adobe, ~1890. LW2871 - "The Chapel at Ramona's Home," Cabinet Card, ~1890. LW3127 - "Home of Ramona" (Rancho Camulos), Private Mailing Card, 1898-1901. The Camulos Rancho • Ventura Free Press, 7-28-1899. LW2560 - Map: Oil Well Locations from Fillmore to Camulos, 1900. LW2134 - "Spanish Fandango at Camulos." Colorized Postcard, 1902. NT1104 - Southern Pacific Camulos Depot, ~1906. LW3506 - Leather Postcard, "Home of Ramona," 1907. LW3439 - Souvenir Postcard with Rare Camulos Postmark, 1908. LW3382 - Postcard: "Ramona at Camulos" (Not Really), ~1909. LW3258 - Postcard: Ramona's Home, Brewster Photo, Published 1907-1914. LW2434 - Portrait of Helen Hunt Jackson from 1909 "Pasadena Edition" of "Ramona." LW2006 - "Home of Ramona" at Rancho Camulos. Souvenir postcard, c. 1910. LW3326 - Veranda, Ramona's Home. Souvenir postcard, c. 1910. LW2022 - Altar at Rancho Camulos. Postcard, 1901-1915. Hand colored. LW3123 - Olive Mill at Rancho Camulos. Postcard, 1901-1915. Hand colored. LW2037 - "Home of Ramona" at Rancho Camulos. 2 Different Postcards, 1910s-20s. Color. LW2085 - "Old Home of Ramona at Camulos." Postcard, ~1909. Color. LW2549 - "Bells of Camulos." Color Postcard ~1909. LW2832 - Cast of "Ramona" (1910): Mary Pickford, Henry Walthall, Kate Bruce at Mountain View Hotel, Piru, April 1910. LW2234 - "Ramona's Bedroom" at Camulos. Colorized postcard, 1910s-20s. LW2235 - "The Court, Old Home of Ramona" at Camulos. Colorized postcard, 1910s-20s. LW2073 - "Sheep Shearing at Camulos, the old home of Ramona." Postcard, 1910s-20s. Color. RA2001 - Southern Pacific Rail Ticket, Camulos to Los Angeles ~1920. LW2084 - "The Garden, Ramona's House, Camulos, Calif." Postcard, c. 1920s. Color. RA5502 - The Bells of Camulos (Photo 1955). LW2554 - Del Valles' Chinese Import Sewing Table from Rancho Camulos (Mid-1800s), 4 Views, 11-23-2013. LW2695 - Del Valle Citrus Labels (2 Varieties), Pre-1924, Discovered 2014. Iconic Camulos Bell, Del Valle Portrait Come Home • SCVHistory, 10-28-2017. LW2717 - Camulos Cemetery Census, from Signage at Rancho Camulos Museum 2014. LP1501 - Camulos Cemetery Postcard ~1915. RA3301 - Letter Re: August Rubel's French WWI Croix de Guerre, 3-9-1933. NT1101 - August Rübel, American Field Service Uniform, WWII (1940s). RA4301 - Letter: Why Are We Here? (Fighting the Nazis?) by August A. Rubel, 1943. NT1039 - Grave Marker of August Rübel, North Africa American Cemetery (1943). Oral Histories: Dr. Glenn S. Dumke, Mary (Rubel) Burger, Jaime Del Valle • 10-9-1958. Oral History Project: Shirley Rubel Lorenz • Interview 4-2-2002. Oral History Project: Shirley Rubel Lorenz • Interview 11-11-2008. NT1014 - Prince Aaggie, Prize Bull of A. Rübel's Billiwhack Dairy, 1920s. LW2120 - Floor Plan of the Del Valle Adobe at Camulos, 1925. RA2101 - Main Del Valle Adobe at Camulos, 8 Views, 1920s-1940s. NT1033 - Baby Shirley Rübel with Bulldog, ~1928. LW3280 - 5 Church Bells from 1896, Purchased 1920s. RA3001 - Schoolhouse Under Construction, 56 Views, 1930. AL1933 - "Home of Ramona Brand" at Rancho Camulos. Crate Label, c. 1930s. Color. NT1013 - Birthday Party for Shirley and Nathalie Rübel, Rancho Camulos, ~1931. RA3101 - August Rübel's American Field Service Assn. Directory (Ambulance Corps Veterans), 1931. NT1022 - Fountain Next to the Cocina, ~1920s-30s. LO3401 - Rancho Camulos Historic American Buildings Survey, 17 Views, 3-22-1934. LO3402 - Rancho Camulos Historic American Buildings Survey Diagrams (Measurements & Uses), 1934/36. RA3501 - Photo Gallery: Rancho Camulos, 1935: August Rubel Collection. RA3601 - Photo Gallery: Rübel Family Garden Party at Camulos, 11-23-1936. RA3602 - Photo Gallery: Rübel Family Views of Camulos, 1936. NT1021 - Rübel Family with Del Valle Family Stagecoach, 4-23-1938. NT1005 - Charlie Rycroft, Camulos Ranch Foreman (n.d. ~1930s). LW2761 - "Ramona and Alessandro on The Narrow Trail" (Painting) by N.C. Wyeth, 1939. Rancho Camulos Appraisal (and Inventory), 1939. NT1102 - August Rübel at His Writing Desk, ~1940. NT1026 - August Rübel and Johnny Dingtoes, a Parrot, ~1940. NT1002 - Harry Jr. & Ella Carey with Barbara & Gerald Rübel, ~1940. NT1019 - August Rübel & Gerald Rübel, 1942. Clipping: Bermite Power Co. Advertisement • Los Angeles Times 1-2-1946. Children's Home Society Tea Draws 600 • Ventura County Star-Free Press, 5-16-1951. NT1103 - Chapel Dressed for Rübel Double Wedding, 1955. RA7101 - Photo Gallery: Rancho Camulos, 1971. An Old Shoe Box: Discovery of a Drawing by Charles M. Russell • By Charles F. Outland, 1975. VIDEO - Rancho Camulos After the 1994 Earthquake • Philip Scorza's Points of Interest. RA9401 - Photo Gallery: Earthquake Damage, Photographed 1-21-1994. LW2119 - Rancho Camulos: National Historic Landmark Dedication Ceremony (3 Views), 5-5-2001. LW2121 - Map of the Grounds at Rancho Camulos, 2001. OA245B - Video: Ramona Days 2009 • Out & About With Roger Martin Episode 245b. LW2463 - 1867 Del Valle Winery, 11 Views, 9-7-2013. LW2465 - Wine Press from Dominguez Ranch, 7 Views, 9-7-2013. Gallery - Ramona Days at Rancho Camulos, 21 Views, 9-7-2013. "NCIS" Ep.11.2: Tony and Ziva in Israel (Rancho Camulos) • CBS 10-1-2013. LW2520 - Grave Marker for Baby August Adrian Rubel, 3 Views, 11-21-2013. Gallery - Future Journeymen Paint 1920 Adobe at Rancho Camulos, Multiple Views, 11-23-2013. LW2716 - Sign from SPRR Camulos Depot, Displayed at Rancho Camulos Museum. Photo 2014. LW3100 - Rancho Camulos Museum 2017 Docent of Year: Marie Wren. LW3101 - Rancho Camulos Museum 2017 Volunteers of Year: Dianne Gay Cox & Jack Infranca. LW3386 - Weireter, Christopher Honored by Camulos Museum, 8-26-2018. RA5503 - 1867 Del Valle Winery, 4 Views, 4-26-1955. LW2463 - Exterior of 1867 Del Valle Winery, 11 Views, 9-7-2013. LW2633 - Del Valle Brandy Still, In Use Circa 1867-1900, 9 Views, 6-28-2014. LW2632 - Native American Grinding Stones, 2 Views, 6-28-2014. LW2630 - Handmade Clay Tiles, 4 Views, 6-28-2014. LW2634 - Original Confessional Window from Del Valle Chapel, 6-28-2014. LW2631 - Broken Statuary Associated with Del Valle Chapel, 6-28-2014. LW2631 - Wall Decor Associated with Del Valle Chapel, 6-28-2014. "Home of Ramona" by Charles F. Lummis, 1888. NOTE: This is a partial selection from the book. Clipping - Marriage of Joseph Y. del Valle. Susanita - Loose Photo of Susanita del Valle. Dedication - From Lummis to Susanita. Page 1 - Outside Corridor. Page 2 - Group Photo incl. Reginaldo del Valle. Page 3 - Nena del Valle Cram and Susanita del Valle. Page 4 - Aerial View of Camulos. Page 5 - Structure and Picket Fence. Page 6a - Ysobel del Valle Cram and Nena del Valle Cram. Page 6b - Outside Corridor leading to Bedrooms. Page 7 - Porch of the Chapel. Page 8 - South Veranda. Page 9 - La Placita. Page 10a - Cross on the Hill. Page 10b - South Veranda.